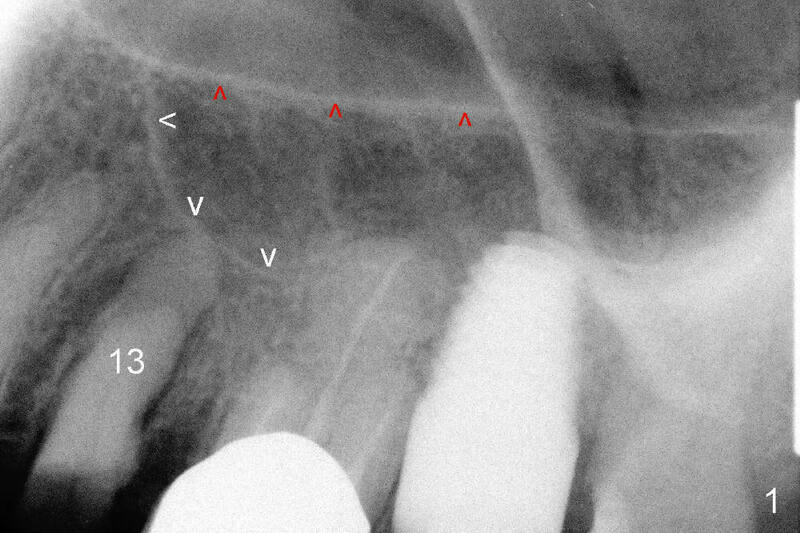 The upper left 2nd premolar (Fig.1: #13) has two roots (a 67-year-old lady). The root stump is ovoid, longer buccolingually (Fig.2: between arrowheads) than mesiodistally. 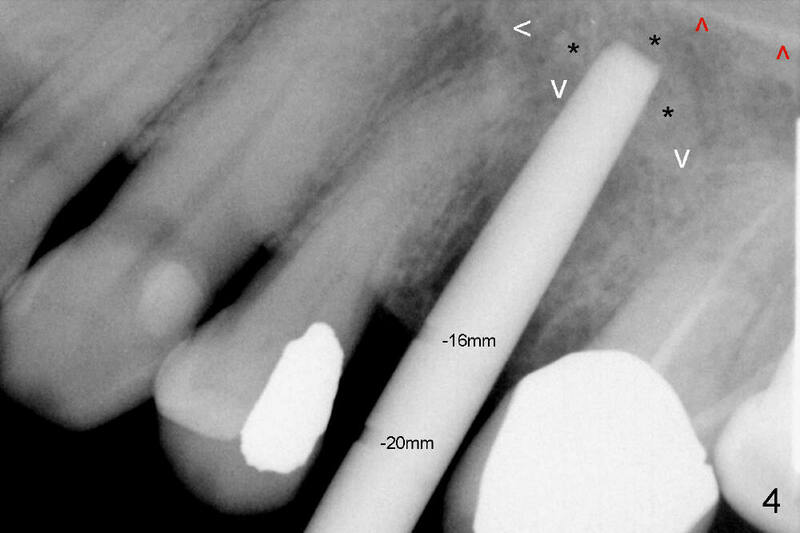 The ovoid extraction socket is more or less D-shaped (Fig.3). 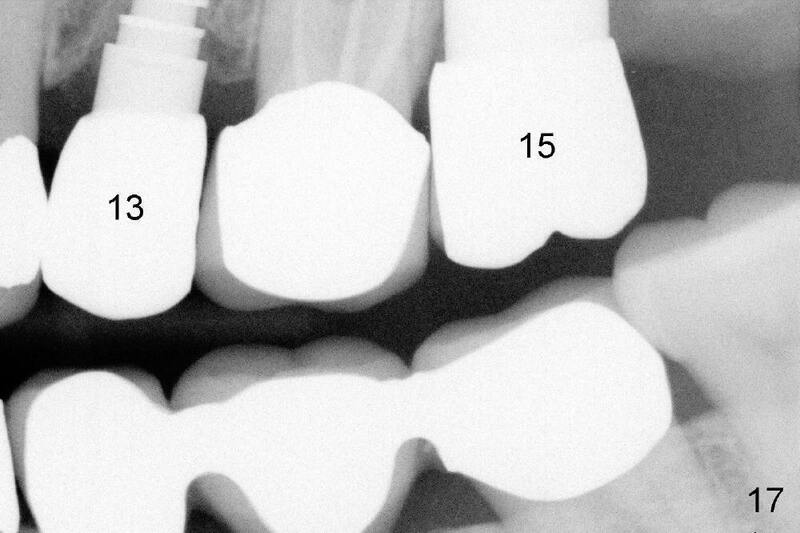 D1 and 2 bone spreaders and thin D2 elliptical socket former are sequentially tapped into the socket 16 mm deep (Fig.4). 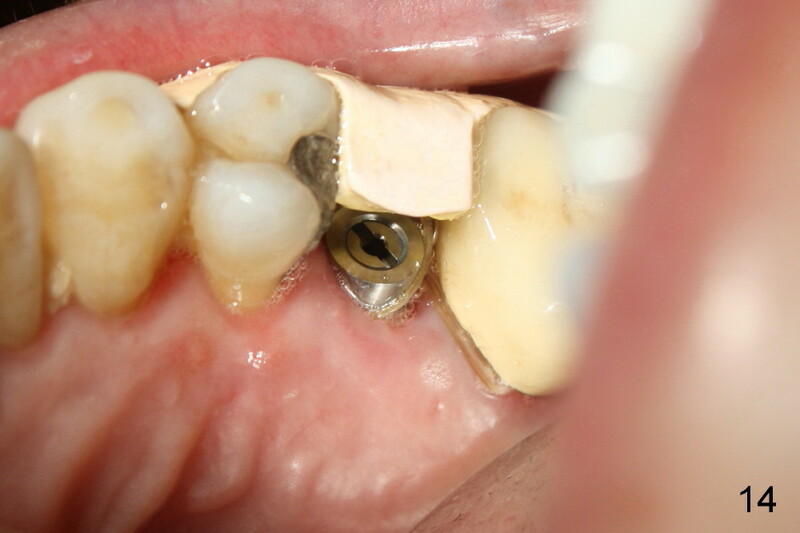 When D2 medium and thick socket formers are inserted, the stability is insufficient. The thick former is tapped until 20 mm with stability. 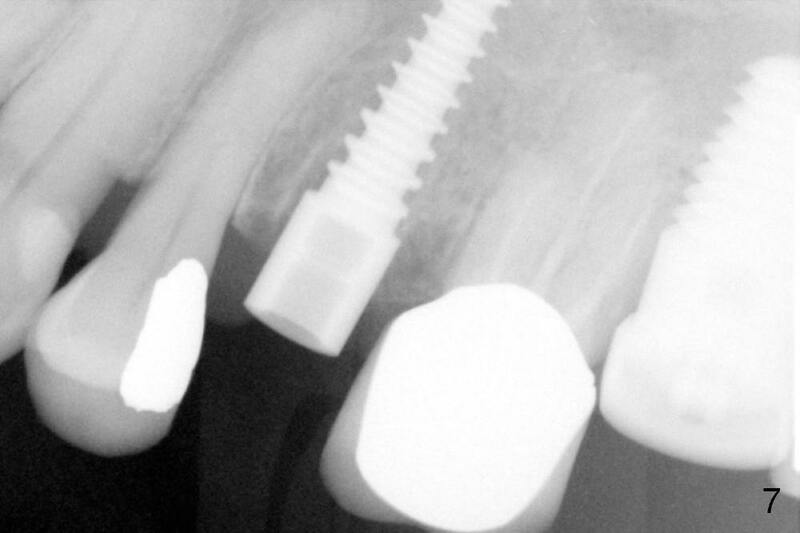 Mixture of freeze dried mineralized allograft and Osteogen is placed in the socket and D2 spreader is used to push bone graft into the sinus. 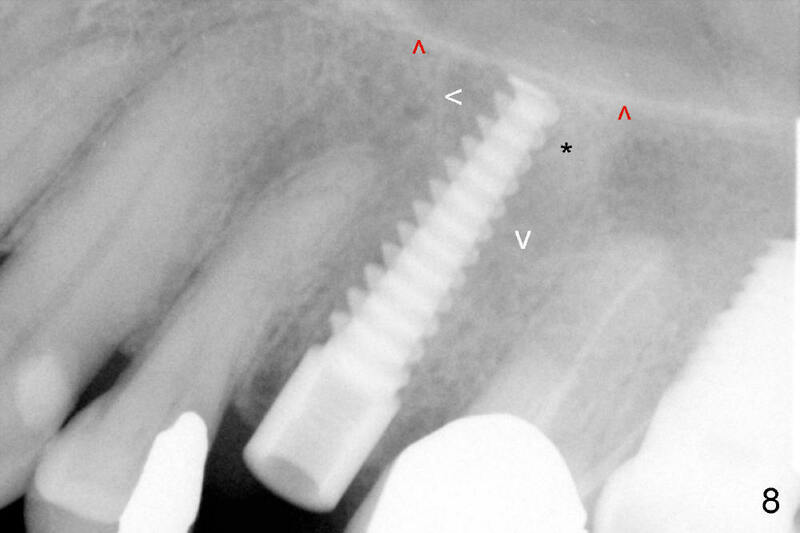 A D2 implant (4.5x20 mm) is going to be placed with the flat surface facing mesially, convex surface distally and the long axis of D buccolingually (Fig.5,6). 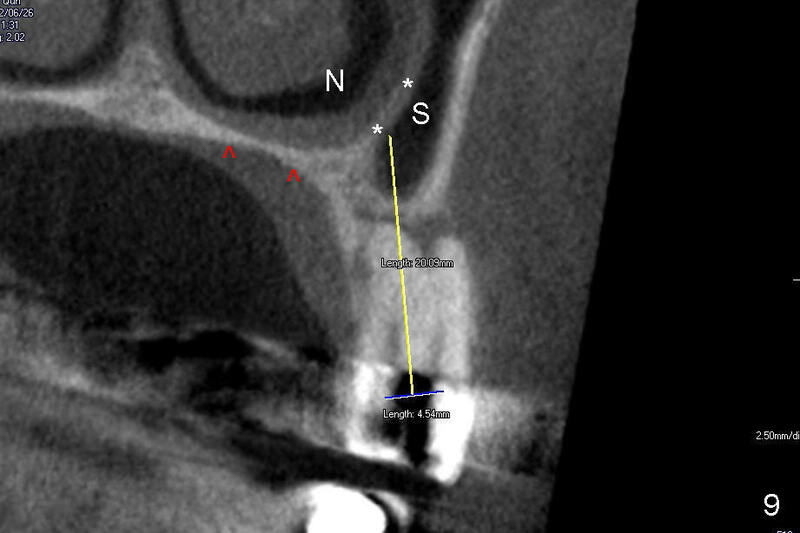 When the D2 implant is placed (Fig.7,8), the most apical fin of the D implant appears to have been bent and possibly hit the nasal floor (Fig.8.9 red arrowheads) or the lateral nasal wall (Fig.9,10 (CBCT coronal and sagittal section) *). 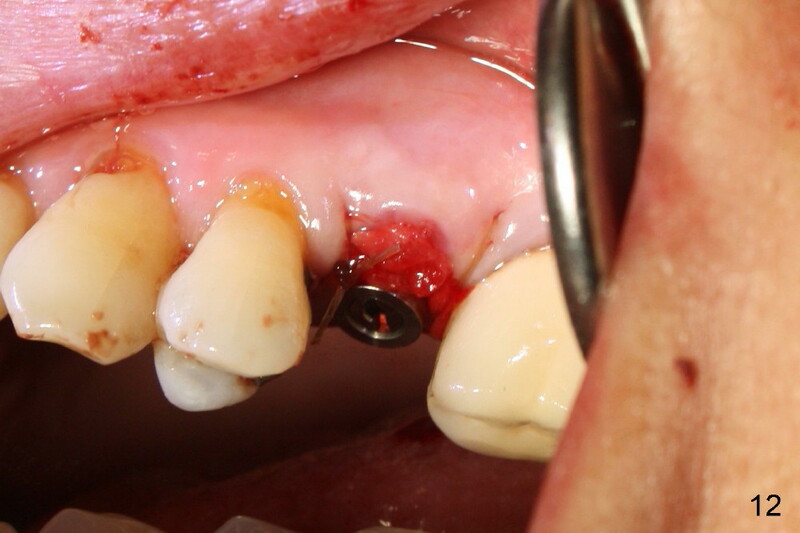 There is no nasal hemorrhage intra- or post-op. 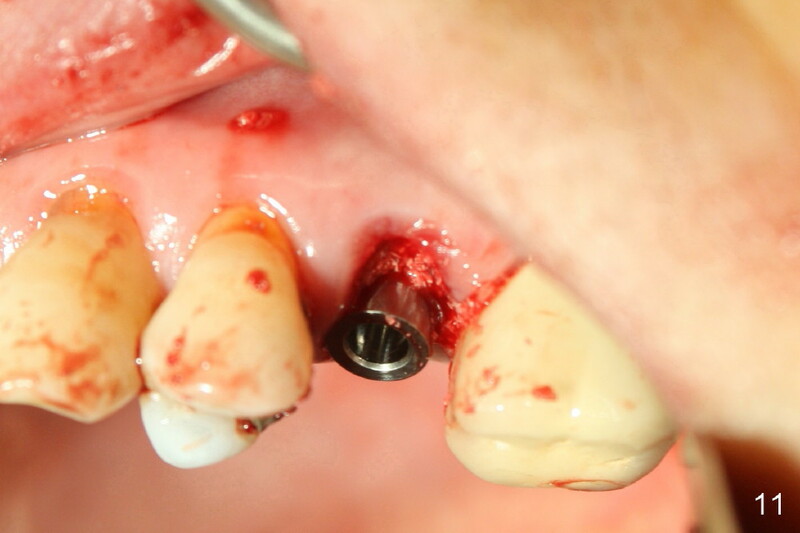 The remaining socket is filled with bone graft (Fig.11), which is covered by collagen membrane (Fig.12,13). 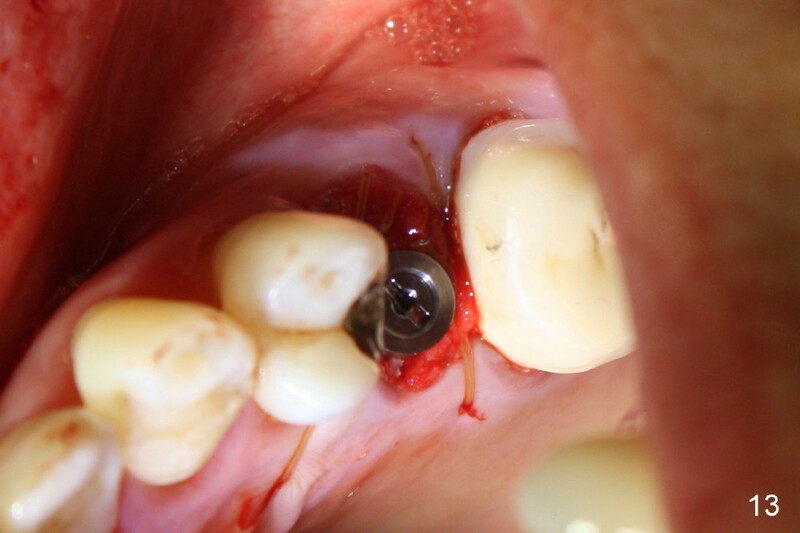 The wound is then covered with perio dressing. 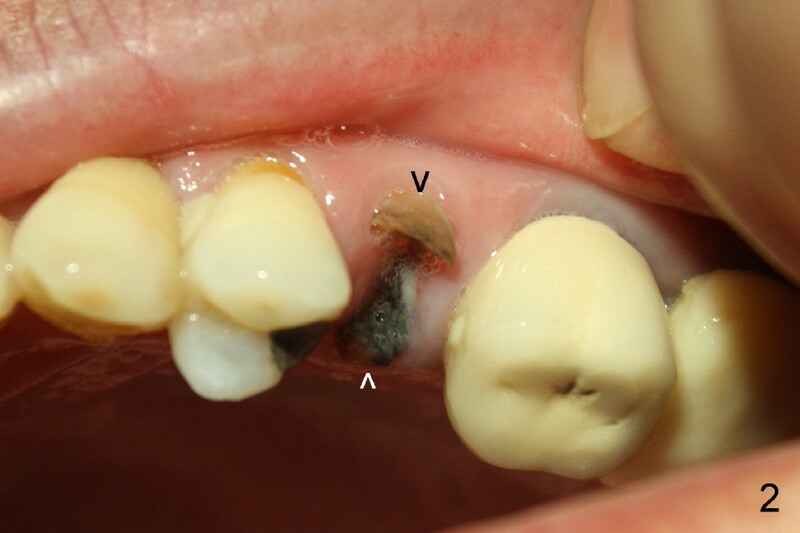 The patient reports apparently traumatic oozing submucosally in the buccal vestibule one day postop, possibly due to green stick fracture apically. By the 7th day postop, the patient is symptom free. 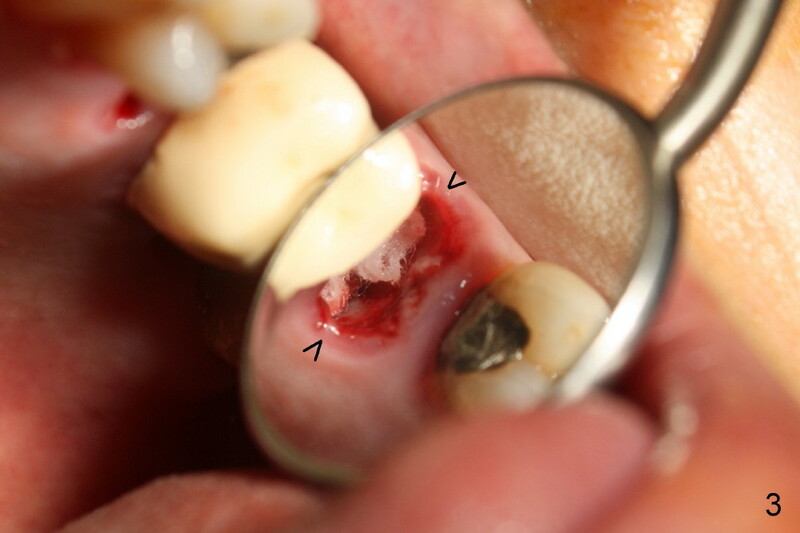 The lingual portion of the perio dressing is dislodged (Fig.14). 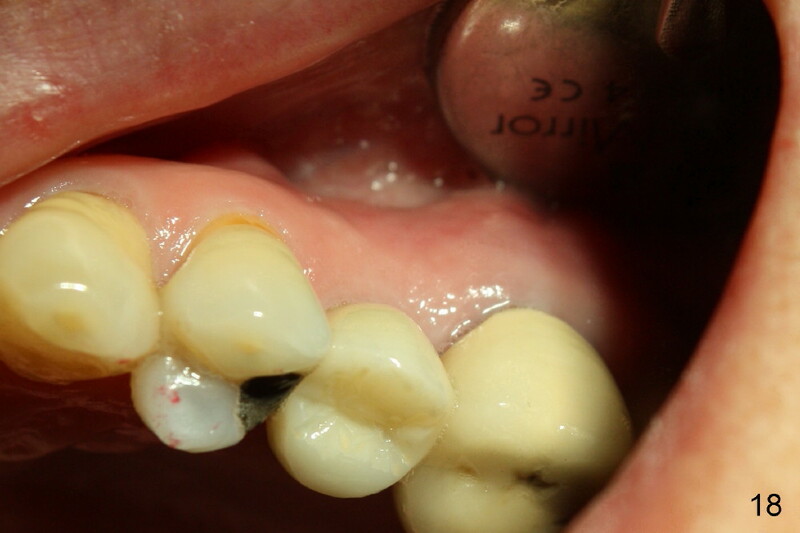 New perio dressing is added. The whole dressing is dislodged 1 month postop (Fig.15). 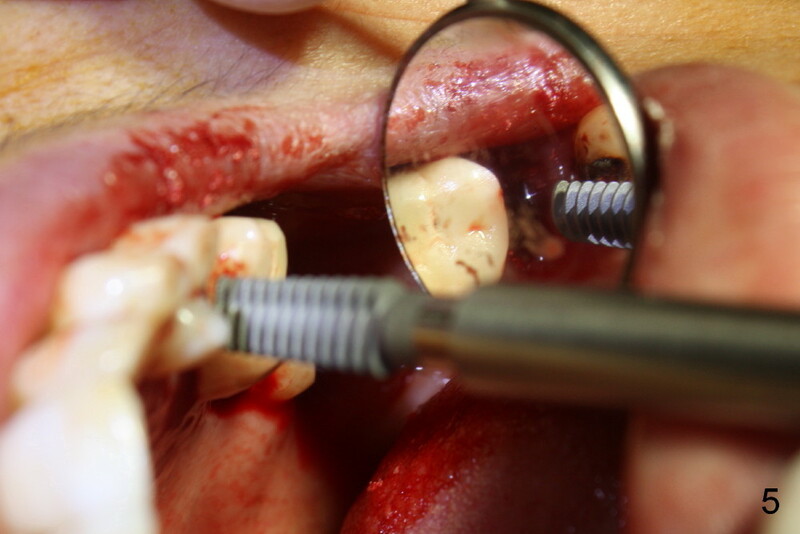 The buccal wound heals with minimal bone graft exposure (>). 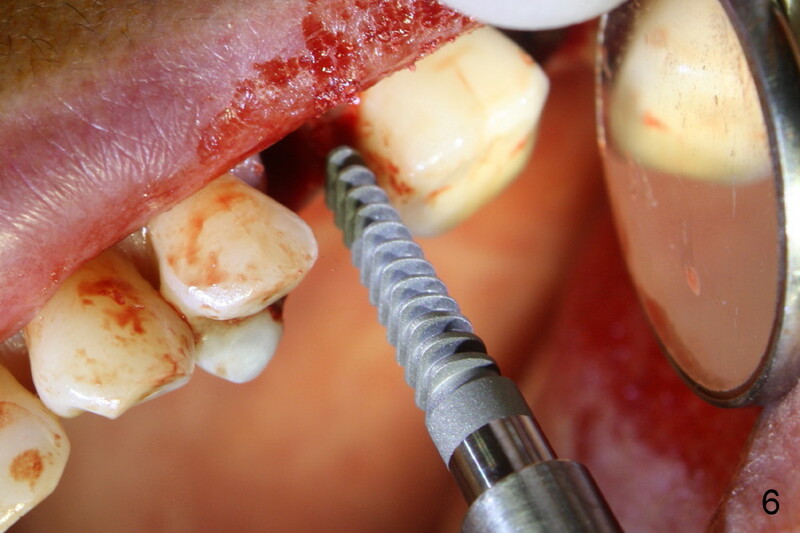 In fact the perio dressing prevents cheek and tongue bite when the tooth is extracted. The socket heals normally. 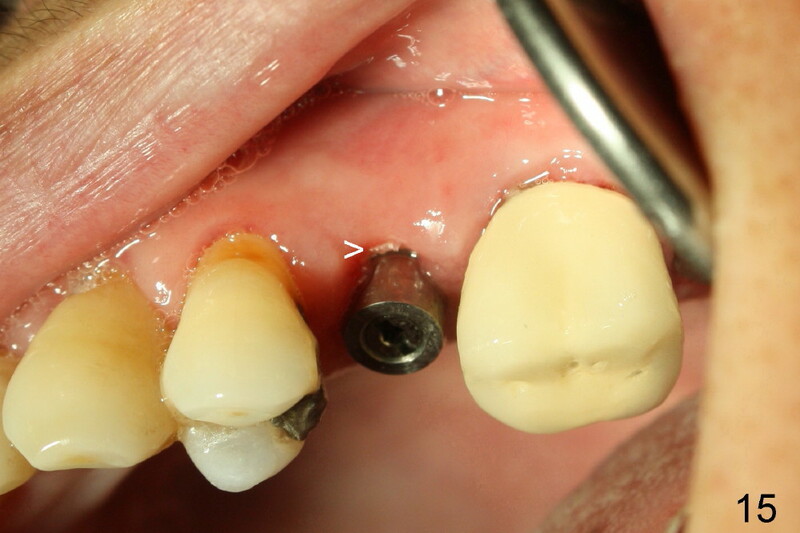 Fig.16,17 are taken 3 and 4 months postop, respectively. 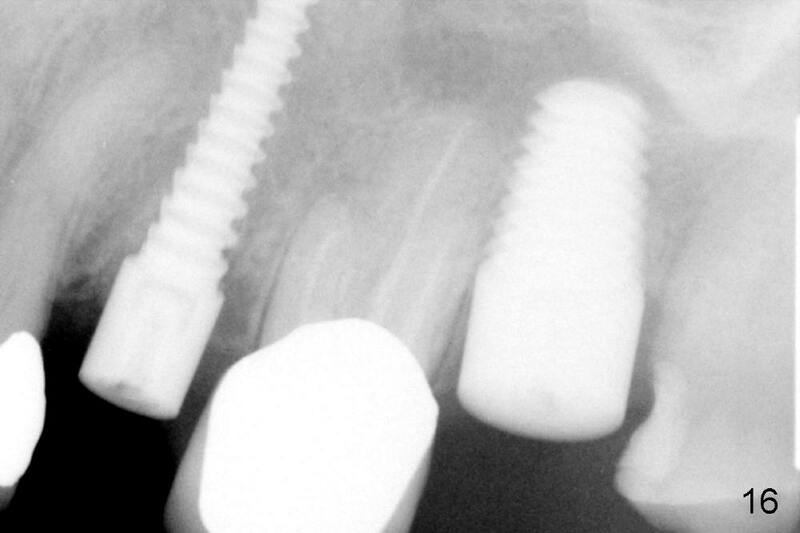 The patient returns less than 2 months post cementation, since she is going to move out of state. 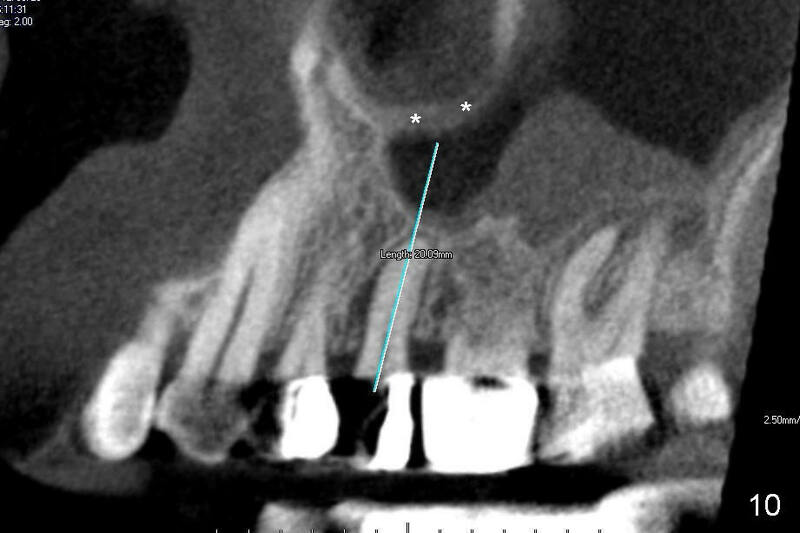 There is minor atrophy over the buccal plate (Fig.18).